The Research Area offers demonstrations of tools, processes or approaches in connection with INA's research activities. Here you can see, test or experiment with projects currently being conducted by INA. In an easy-to-use environment, the Research Area presents in a clear manner the experiments, methods of use and concepts implemented. This area brings together some salient INA developments in the field of digital media. The Research Department spotlights our prototypes and demonstrations to show how our researchers and research engineers have contributed to the elaboration and use of these tools. The Research Area welcomes reactions, questions and comment, with a view towards improving the results or even initiating new collaborations. From the 1930s to the 1960s, all audio recordings of radio stations were kept on 78rpm discs (tapes only started to be used routinely from 1960). Over time these records (discs) have deteriorated through handling or natural causes. Some records having priceless historical value can no longer be read using conventional means (magnetic cells with a diamond stylus) and the surface of the disk cannot be mechanically restored. Some 20,000 of INA's 276,000 discs are in such a condition. The same applies to large amounts of archives of radio broadcasting organisations all over the world. Scratched, broken or split discs cannot be played by mechanical means. This is also true of discs whose surface has altered and deteriorated. 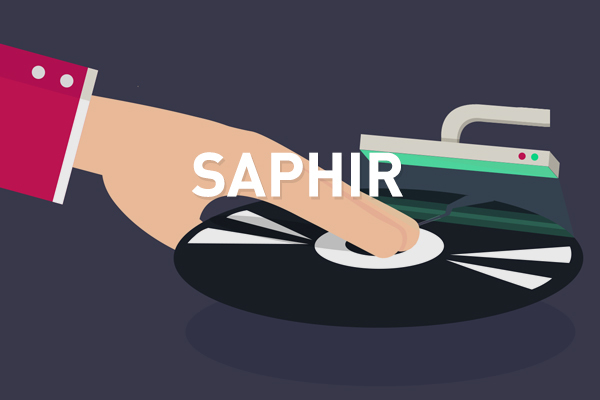 Our process can read these discs optically, without a stylus and without any physical contact. The growth in the amounts of data to archive imposes new productivity constraints on documentation. While automated tools provide valuable help for indexing purposes, they cannot yet replace human intervention. So we need to cut the amount of time spent viewing a set of multimedia documents by offering representations that let the user monitor the content of a program without having to view it, as well as the content of sets of documents. Quickly viewing multimedia content, "similar" content according to different types of similarity, handling it and validating its description, this stands as a real challenge for the years to come. In this respect, data viewing, indexing and mining complement one another, offering the user ease of access, reading and resource handling. 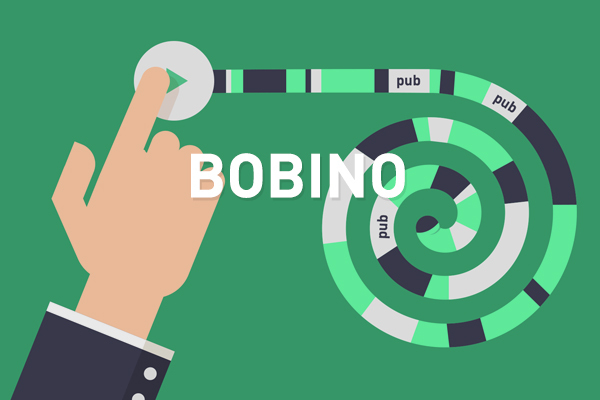 Three interfaces have been developed to explore video content on different scales: Collection Explorer, Bobino Explorer and News Explorer. 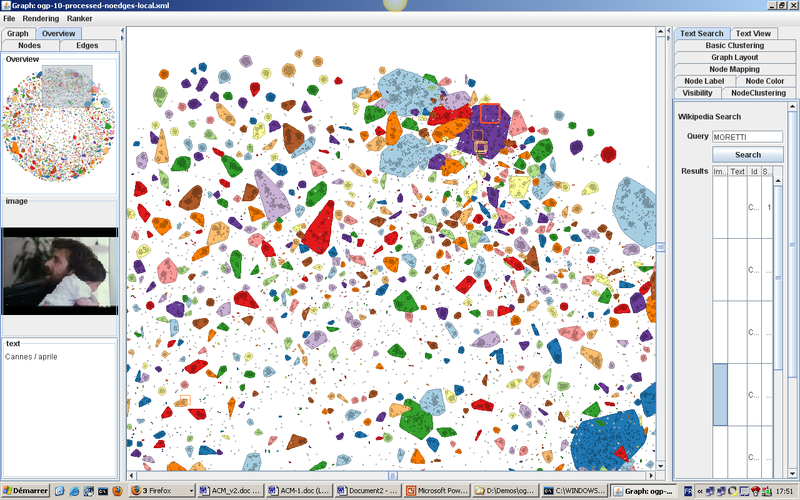 These tools are based on an automatic analysis of multimedia content. Famous voices haunt the French audiovisual heritage. Politicians, athletes, intellectuals, anchormen, our broadcast history resonates with heroic, tender, comical or dramatic accents. Speech processing technologies allow the extraction of valuable information from the audio signal. Discrimination of speech and music zones, automatic segmentation in speaker turns and identification of a person using his voice characteristics or automatic speech recognition, there are nowadays many tools available. 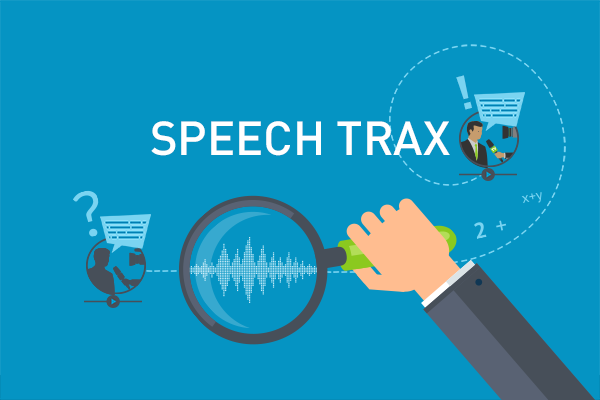 The aim of the Speech Trax demo (for speech tracking) is to gather results of these multiple analysis in order to visualize them in an interface allowing an easy exploration. 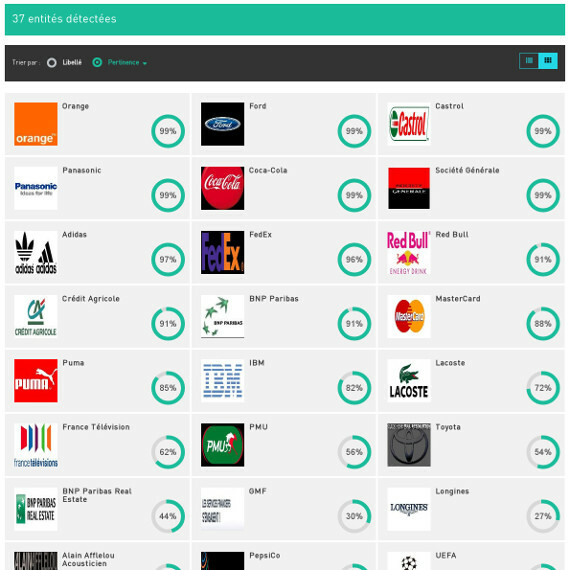 Choice was made to treat radio and television data from March 2014 for public channels France 2, France 5, France 24, France Inter, France Info and France Culture. This specific time period was chosen due to the important events that occurred (local elections, former president Sarkozy phone tapping, Ukraine invasion by Russian troops, Malaysian Airlines flight 370, etc.) In total more than 250 hours of broadcast news and magazines have been analyzed. Collaborations with several French universities were led: the Laboratoire d’Informatique de l’Université du Maine (LIUM) and the Laboratoire d’Informatique d’Avignon (LIA) for the speaker segmentation and identification, the Institut de Recherche en Informatique de Toulouse (IRIT) for the speech/music discrimination and the society Vocapia Research for the speech recognition realized using the software VoxSigma. For archivists: issue a raw and imperfect documentation of the contents kept at INA to help its detailed description. For INA customers and users: propose new ways of exploring audiovisual collections based on oral interventions of famous French speakers. The French National Audiovisual Institute (INA) provides the scientific and technological community a corpus of audiovisual documents from its collections, document sheets and metadata associated with these documents. 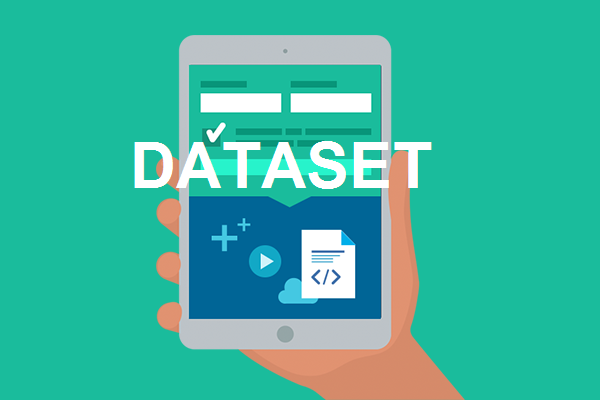 This corpus is intended for finalising, experimentation and evaluation of search and analysis tools for multimedia content, strictly as part of scientific research. 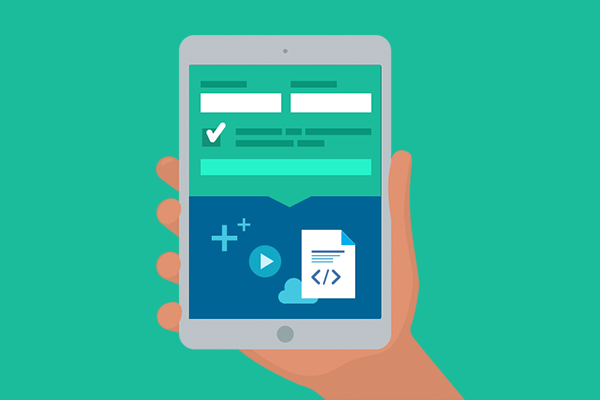 To access the Corpus, you must have first subscribed and have an FTP client available allowing you to download the Corpus. The Corpus is made available under the conditions specified in the Conditions of Use, to any legal entity having previously subscribed and accepted all the aforesaid Conditions of Use. Subscription is restricted to research laboratories, innovative SMEs as well as all other legal entities having a scientific research department or activity. Your request will be sent to INA for consideration. After your request has been approved, you will receive an e-mail confirming the address for the FTP server as well as the confidential login name and password assigned to your Organisation, allowing you to access the Corpus. Videos in INA's archives contain a wide variety and large numbers of visual entities that are really worth annotating if they one day need to be found quickly. These visual entities, which may be logos, works of art, building, faces, etc., are difficult to annotate by humans, even expert humans like INA's research assistants. First of all because this is a very time-consuming task; then because certain entities are so rare that few people are able to identify them. So the purpose of DigInPix is to automatically identify as many visual entities as possible from a predefined list of entities grouped into "dictionaries". Albeit more difficult, the system can sometimes detect an entity occupying a very small portion of the image. On the other hand it is not suited to categorizing images or videos (sunsets, beach scenes, mountain scenes, dogs, etc.). Smart city, smart museum, etc. The synopses drafted by INA's archivists do not always include information that can pinpoint them on the medium (start and end times, or "TC in" and "TC out"). This demonstration illustrates an automatic time-slicing process for TV news programs and automatic time-stamping ("TC in" and "TC out") of the related synopses. First of all, "on set" sequences are pinpointed by automatically identifying the voice of the presenter with software developed by the University of Maine's IT Laboratory (LIUM). Speech is automatically transcribed with the VoxSigma software package (developed by VOCAPIA Research). Each news item synopsis is then "positioned" on the timeline of the news program. 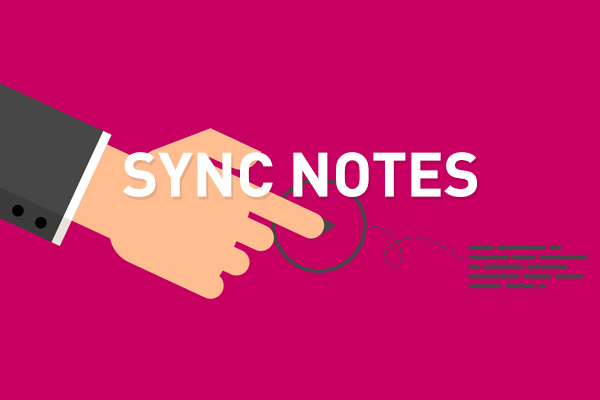 To that end the text of the synopsis (title, summary and keywords) is compared with the portions of the transcription that temporally match studio scenes and sequences between them, using a comparison measure that takes into account all the words in the synopsis on the one hand and the portion of the transcription on the other. Each synopsis is then matched up with the time segment whose similarity between the synopsis and the transcription portion is the closest. 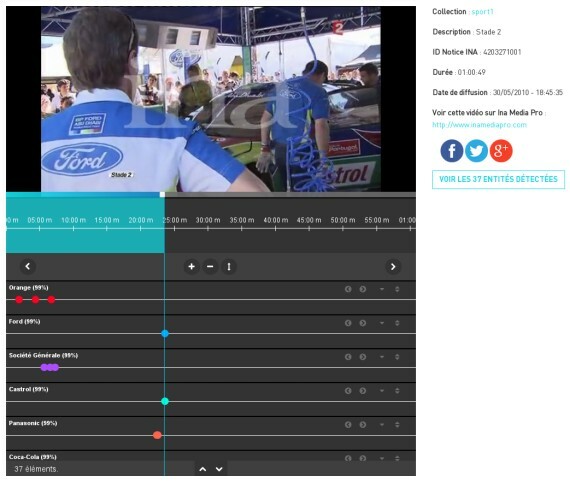 A distinction is made between studio items, which are positioned within studio sequences, and other items such as reports (positioned between the studio sequences). 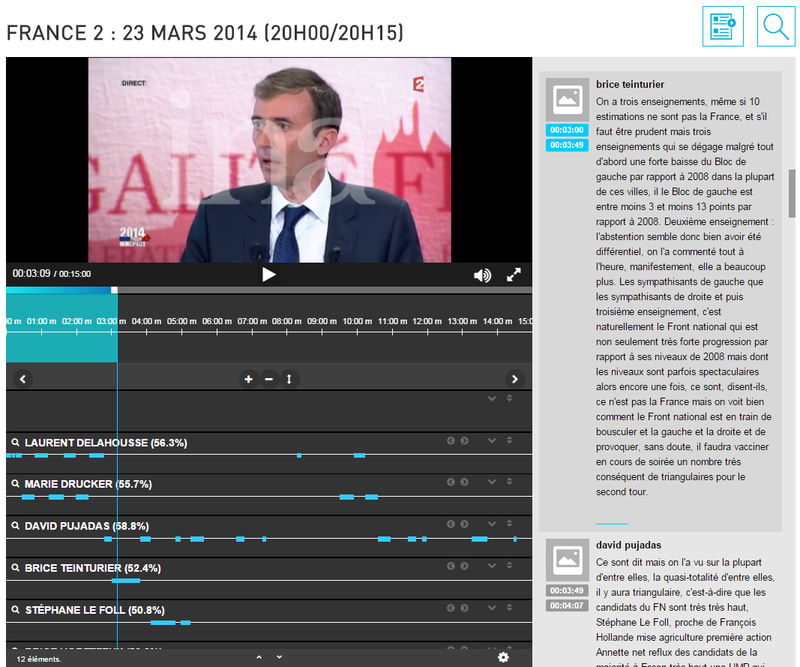 For archivists: time savings in describing TV news items by automatically proposing timecodes. The applicable GTU are accessible online on the Sites when you access them. The "last updated" date is specified at the top of the document. INA reserves the right to modify these GTU without notice at any time, inter alia to reflect any statutory, regulatory, editorial and/or technical changes. Modifications to the GTU come into effect and are binding upon web users as soon as they are published on the Sites. By continuing to browse you agree unreservedly to abide by the current GTU and French law. If you wish to use the DigInPix prototype, you should also accept the Supplementary Conditions of the DigInPix Service. The Sites, prototypes ("the Prototypes") presented on the Sites (such as Diginpix, Syncnotes, Bobino, Saphir) and content ("the Content") on the Sites (such as audiovisual and audio content, texts, logos, databases, software) are protected by law, more particularly the provisions of the French Intellectual Property Code. All rights to the Sites, Prototypes and Content are thus strictly reserved. You do not acquire any intellectual property rights to these elements. You may only use them under the conditions stipulated in these GTU. The name and e-mail address you enter on the "CONTACT" form are used solely to send the corresponding message and are not stored by INA. A cookie is a small piece of data sent from a web site and stored in a user's web browser. It contains details such as the name of the server, an identifier in the form of a unique number, and possibly an expiry date. Servers access them to read and record information. Your browser automatically sends us certain standard data, such as your IP address, the type of browser you use, its functions, your operating system, any third-party site from which you may have reached these Sites and the dates and times at which you accessed the Sites. This enables us to keep statistics on Site visits, measure the general activity of the Sites, pinpoint any errors and ensure that the Sites have adequate material resources. This collected data, in particular your IP address, does not compromise your anonymity. You are free to accept or refuse this Xiti cookie. You can also delete cookies stored on your computer to permanently remove the data they contain. In the History section, for the History rules option, select Use custom settings for history. Uncheck mark Accept cookies from sites option to disable cookies. Click the Tools button, point to Safety and then click Delete browsing history. Click the Tools button then click Internet Options. Click the Chrome menu on the browser's toolbar. In the "Privacy" section click Content settings. In the "Cookies" section, you can change the following settings: "Delete cookies".Block cookies by default"
To remove stored cookies: Click Remove All Website Data, or click Details and select one or more websites then click Remove . To change how cookies are blocked : Select an option in the "Block cookies and other website data" section. You assume total responsibility and risk for your use of the Sites. You acknowledge and accept the characteristics, technical performance, limits and risks of the Internet. You are responsible for taking all appropriate measures to protect your data and/or software and/or hardware against any infection, misappropriation, hacking, viruses, malware or intrusion attempts. You assume full liability for your use of the Sites, Prototypes and/or Content and for any misuse thereof, in particular unlawful, improper and/or unauthorized use. The Sites may be interrupted by INA at any time for maintenance purposes or due to cases of force majeure, INA accepting no liability in that respect. It is agreed that the Sites and Prototypes are supplied "as is". INA cannot guarantee that the Sites and Prototypes are free from any errors or that any such errors will be corrected. INA provides no personal assistance or hot line. INA cannot guarantee the accuracy, precision or exhaustiveness of the information provided on the Sites. Accordingly, INA accepts no liability for any inaccuracy or omission therein. Moreover, INA shall on no account be liable for the use of Prototypes or interpretation of information provided on the Sites. Generally speaking, INA can on no account be held liable for any direct or consequential damage resulting from connections, interruptions, use or any malfunctions of the Sites or resulting from the impossibility of using the Sites. These GTU are governed by French law. Any dispute in connection with the applicability, interpretation or execution of these GTU shall be referred to the competent French courts. These supplementary conditions of use ("Supplementary Conditions") govern the use of your images within the framework of the DigInPix Service proposed by INA on http://diginpix.ina.fr/en. 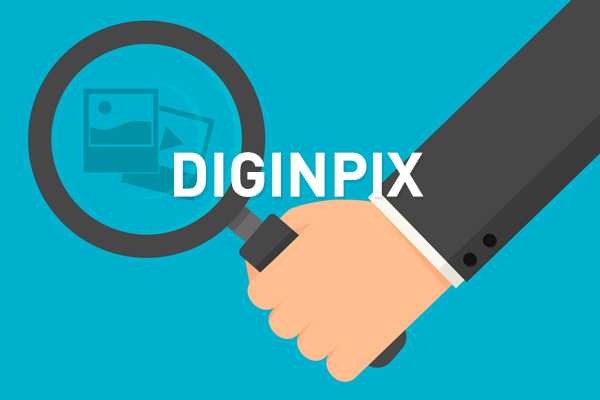 The fact of uploading images on diginpix.ina.fr Site implies your prior, express and unqualified acceptance of these Supplementary Conditions and of the GTU which are not incompatible with the former. The applicable Supplementary Conditions are those published on the diginpix.ina.fr Site on the day you use the Service. The "last updated" date is specified at the top of the GTU. INA reserves the right to modify these Supplementary Conditions without notice at any time, inter alia to reflect any statutory, regulatory, editorial and/or technical changes. Modifications to the Supplementary Conditions come into effect and are binding upon Users as soon as they are published on the diginpix.ina.fr Site. If you represent a legal entity, you guarantee that you are vested with the necessary authority and powers to accept these Supplementary Conditions. If you do not accept or are not empowered to accept these Supplementary Conditions, do not submit your images to the Service and hence do not use the Service. The DigInPix Service offered and operated by INA enables individuals or legal entities to identify visual objects in their images for testing purposes. a reliability score the Service attributes to the identification of the visual object in the Image. The Service is accessible to any natural or legal person who has unconditionally accepted the GTU and these Supplementary Conditions of Use and has the authority to do so. The Service is provided to the free of charge, for non-commercial and non-exclusive use for the purpose of experimenting with the Service. The User therefore undertakes to use the Service solely for the purpose of identifying visual objects in its Images. Any use for other purposes, commercial purposes in particular, is subject to INA's prior written consent (Contact us by e-mail at diginpix@ina.fr). Any automated use of the Service is prohibited. use the Service for illegal or unlawful purposes or purposes prohibited by these Supplementary Conditions. The Service is not designed for storing Images; it is up to the User to personally take the necessary steps in this respect. You retain all your intellectual property rights to the Images you submit to the diginpix.ina.fr Site. You are solely responsible for the Images you submit to the diginpix.ina.fr Site, as INA can on no account be responsible for Users' Images. you comply with current statutory and regulatory provisions. You undertake to release INA from any liability and guarantee it against any claim, complaint, lawsuit or legal action resulting from or relating to your Images, your use of the Service or further to your breach of the GTU and these Supplementary Conditions. You undertake to pay INA compensation for any resulting damages, claims, costs and expenses (including lawyer's fees). In this respect, you agree to INA storing your Images and automatically analyses by means of the Service. Within the functional framework of the Service, the Image(s) and Results of the automatic analysis are made available to the User by means of a URL that INA sends only to the User. The User alone is responsible for disclosing the URL to any third parties of its choosing for the purpose of sharing the Images and Results; INA shall on no account be liable for the use of the URL by the said third parties. INA may on no account disclose, assign, transfer or distribute the Images to third parties, nor use them for any purpose other than the Service. INA reserves the option to delete your Images, Results and related URLs at any time, without notice or any form of compensation. You may ask INA at any time to delete your Images, Results and related URLs; to that end, use the "Contact" form or send an e-mail to diginpix@ina.fr stating precisely which URLs you wish to have deleted. Without prejudice to the User's rights to the Images, the Image-related Results generated by the Service belong to INA. You may not copy, modify, sell or distribute them to third parties, nor may you create works or derivative products based on the Results. You may not grant access to or distribute them to third parties under conditions other than those expressly permitted by these Supplementary Conditions. As hoster of Images, and in accordance with its statutory requirements, INA retains Users' identification data (inter alia the IP address). This data is processed to comply with the provisions of decree no. 2011-29 of 25 February 2011 on the retention and communication of data identifying anyone who has contributed to the creation of online content. INA alone receives this data. As required by the "Informatique et Libertés" (French data protection) law of 6 January 1978 modified in 2004, you have the right to access and correct the data relating to you. You can exercise this right by writing to CIL, Legal Department, INA, 4, avenue de l’Europe, 94366 Bry-sur-Marne Cedex France, or by sending an e-mail to cil@ina.fr. You may also on legitimate grounds object to the processing of the data relating to you. your use of the Service and any misuse of the Service's functions, inter alia any unlawful, improper and/or unauthorized use of the Service and more particularly of the Results. As hoster, INA is under no general obligation to monitor the Images. remove any manifestly illegal Images as soon as it has knowledge thereof. To that end, each Image includes a link labeled "Report this Content". It is agreed that the Service is provided "as is". INA can on no account be held liable for any direct or consequential damage resulting from connections, interruptions, use or any malfunctions of the Sites or resulting from the impossibility of using the Sites (inter alia any loss, damage, hacking or misappropriation of data and/or Images). INA cannot guarantee the availability of, or regularity of access to, the Service. You are advised that the Service may be interrupted among other reasons for maintenance purposes, due to failures, technical hitches caused by the communications networks used, malevolent action or any other harm or damage caused to INA's hardware or software. INA cannot guarantee that the Service is free from any computing errors or that any such errors will be corrected. INA provides no personal assistance or hot line. Accordingly, INA shall on no account be liable for any interruption in or malfunctioning of the Service for whatever reason, or for the duration or frequency thereof. INA does not guarantee the reliability, accuracy, precision or completeness of the Results obtained through this Service. Accordingly, INA accepts no liability for any imprecision, inaccuracy, error or omission in or relating to the Results. INA reserves the right, at any time and without compensation or notice, to close down or suspend the Service. Notification of closure of the Service will be notified on the diginpix.ina.fr Site within a reasonable time. These Supplementary Conditions are governed by French law. Any dispute in connection with the applicability, interpretation or execution of these Supplementary Conditions shall be referred to the competent French courts. This site uses the latest HTML5 functions and thus requires a recent browser for correct display. We strongly advise you to use Firefox or Chrome.